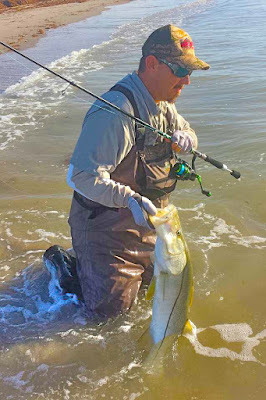 Inshore the snook bite has been good with a few nice fish in the inlet with live bait and jigs the tarpon are starting to show up on the beach in the schools of glass minnows with a few a few snook mixed in. 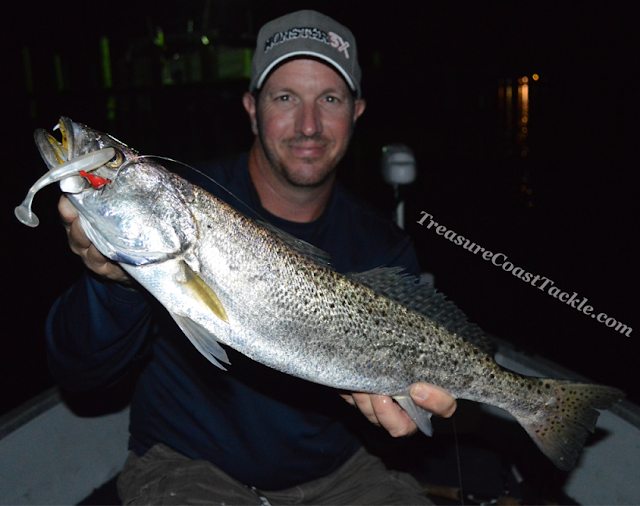 The reds have been around to the north around Harbor branch to Vero shores with a few nice trout mixed in. Inlet anglers can expect more showers throughout the day with the chance of rain standing at 70%. Winds will remain southerly gusting to 15 mph. For the boaters, NWS is predicting numerous offshore, moving squalls and thunderstorms. Seas will be 3 to 4 feet. Right now, Saturday and Sunday's forecast looks mostly soggy as well. Sebastian Inlet Bait and Tackle Shop's Tommy Turowski says it's another quiet morning at the channel. For the most part, the bite has been slow but some jack, snapper and C/R snook are finding their way over the rails. Once again, the greenies and mojarra are plentiful. Today's featured angler is Bee Nguyen. Bee fished at the Inlet and reported that snappers were biting big time. He and his two buddies caught their bag limit in just one hour. 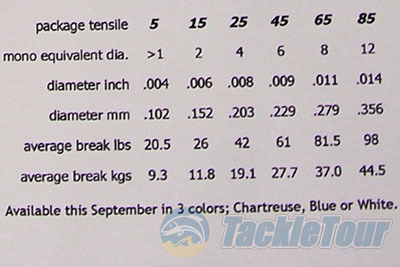 Bee credited most of their snapper success to the use of light tackle. 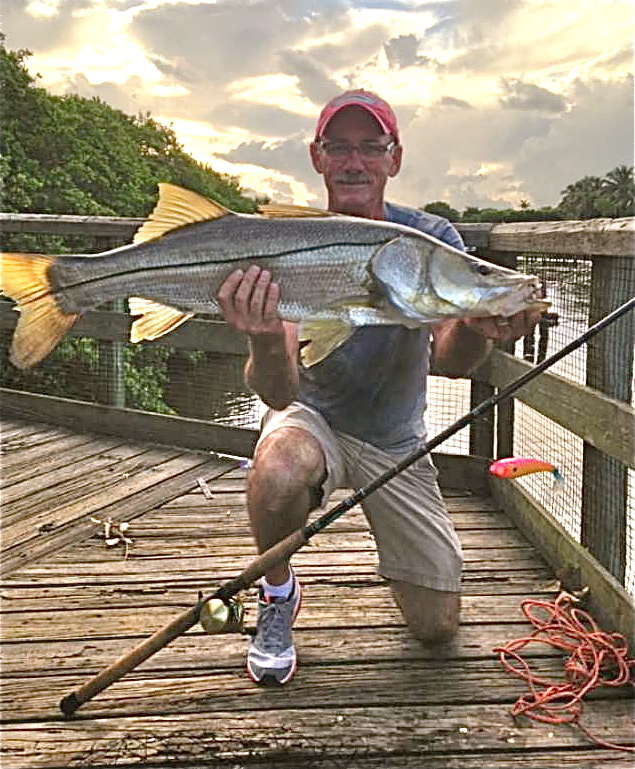 The snook are out in full force in the Treasure Coast, and they are being found in the inlets, along the beaches, and in the Indian River. 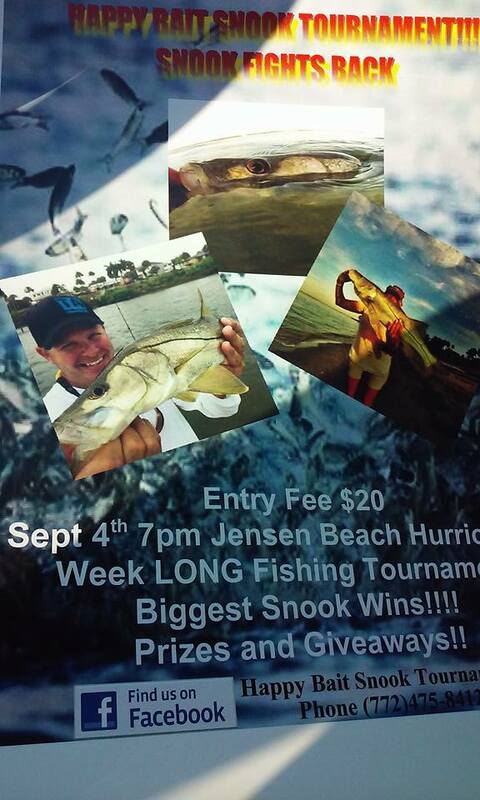 Keep in mind that snook season closed last night at midnight, and will reopen on Sept. 1. 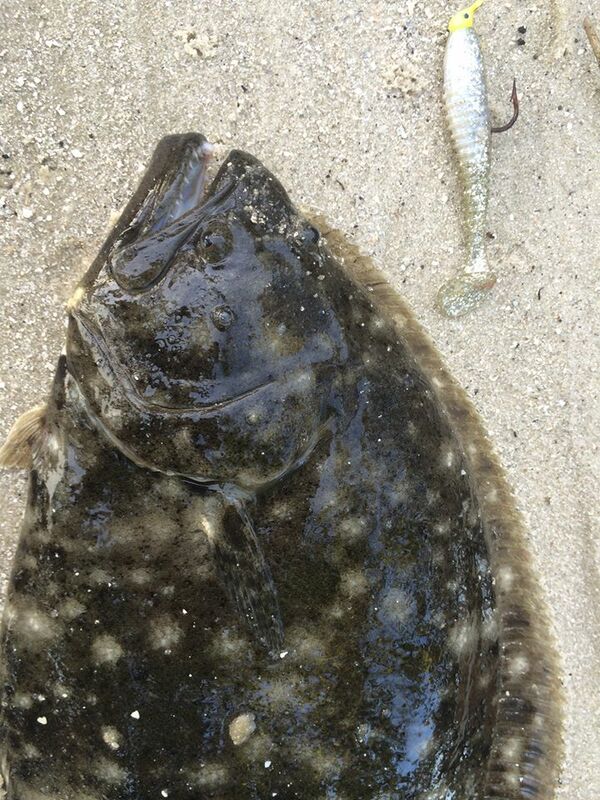 The beaches are also holding good numbers of whiting and croaker. 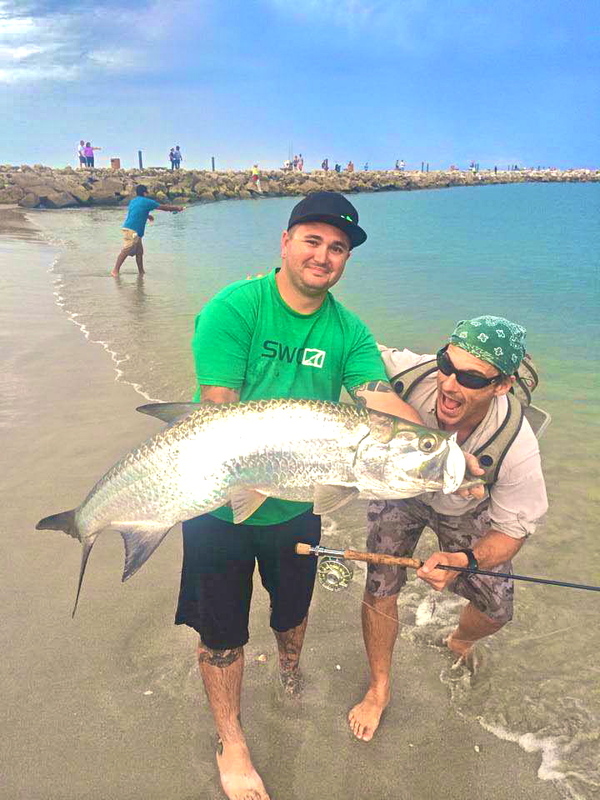 Tarpon are showing up around the inlets, and the early-morning bite has been strong. You should also have success targeting them in the early evening after a heavy storm. 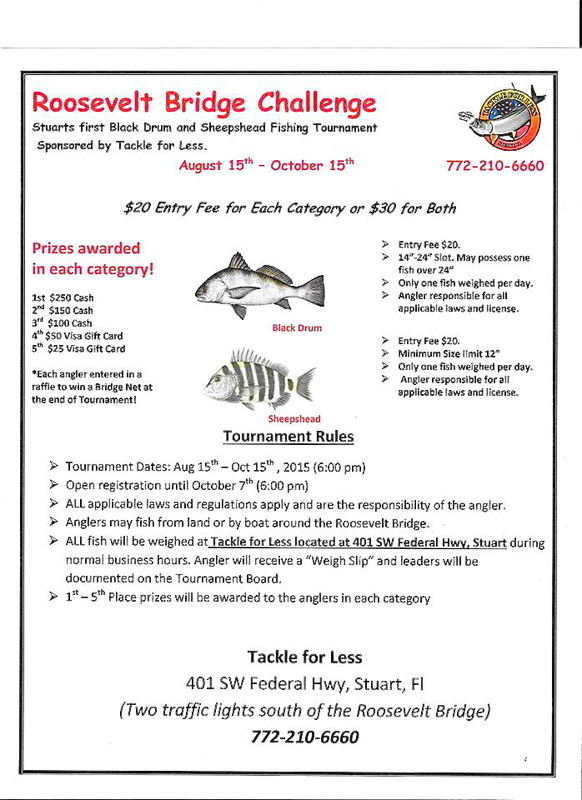 Redfish, flounder, and some snapper are being caught in the St. Lucie Inlet as well. 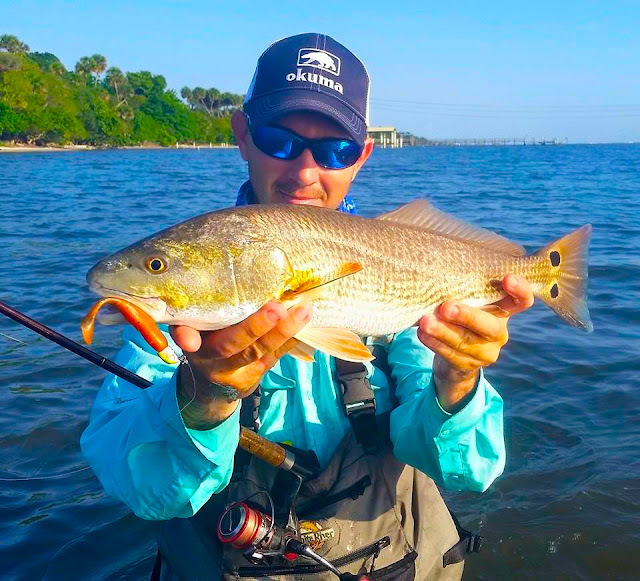 In addition to snook, anglers are catching plenty of redfish and trout in the Indian River, especially around the bridges. 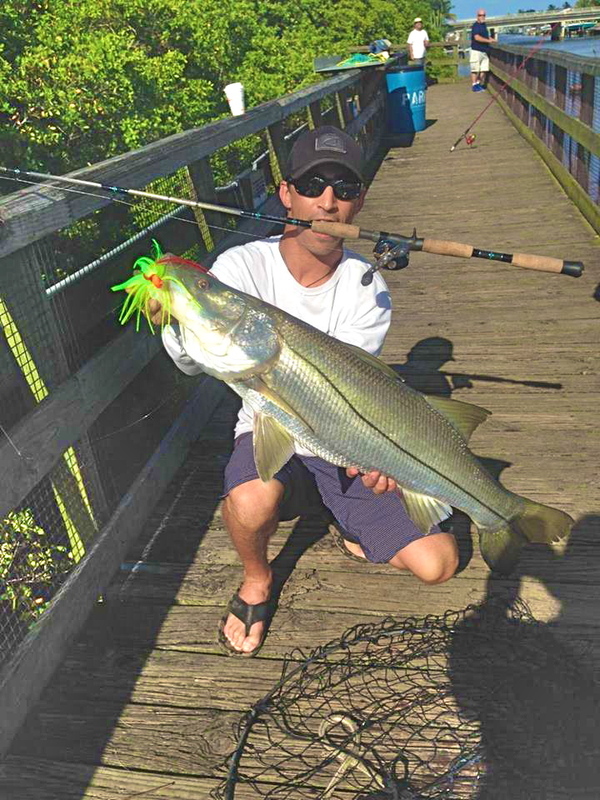 The snook are steady along the beaches of Jupiter, as well as in the inlet and around the bridges on the Intracoastal Waterway. 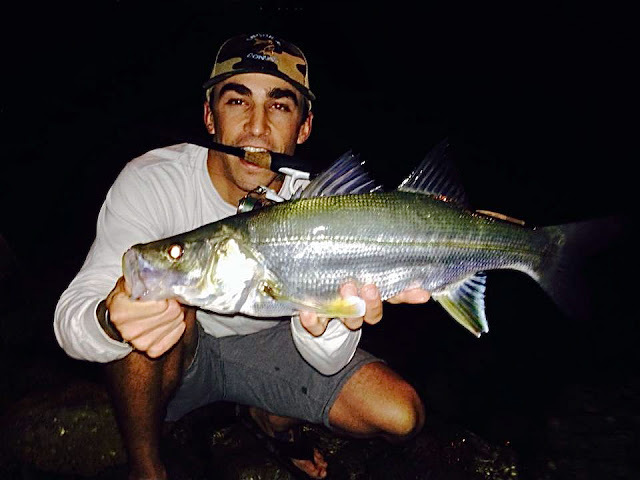 Croaker are also thick along the beach, and they make great bait for those hoping to hook a slot-size snook. 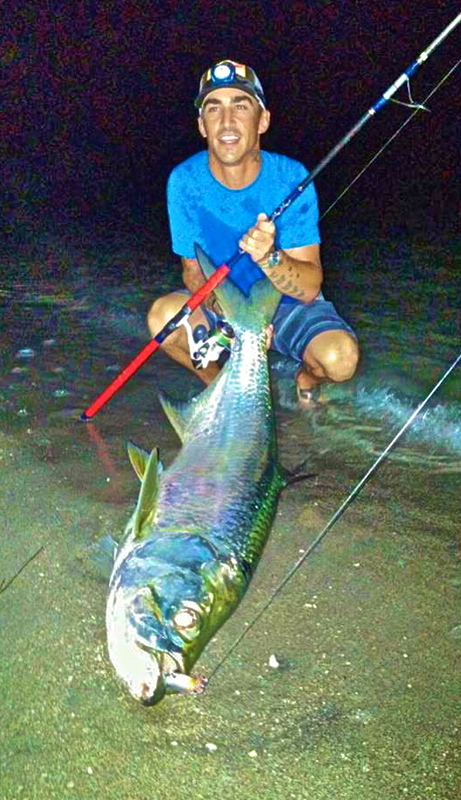 Anglers fishing from the Hobe Sound public beach are still reporting bluefish and Spanish mackerel. It has been windy on Lake Okeechobee, which has dirtied the water in several places. The shiner bite has still been solid, but artificials haven’t been quite as productive. The wind has been blowing out of the west, which has made fishing on the west side of the lake your best bite. Before the winds shifted, the east side on the lake was on fire. Many of the bass have moved back inside a bit and are chasing shad. There is a full moon coming up, which should produce a good bluegill spawn. In between the partly sunny skies, anglers can expect more showers and thunderstorms today at the Inlet likely after 11 A.M. The chance of precipitation stands at 60%. West southwest winds will predominate at around 5 to 15 mph. The seas will be 2 to 3 feet with a light chop on the intracoastal. Fortunately, there are no NOAA advisories posted at this time. Sebastian Inlet Bait and Tackle Shop's Tommy Turowski reports a quiet morning on the jetty with a fair bite from some jacks, snapper and some big Reds on the outgoing tide. 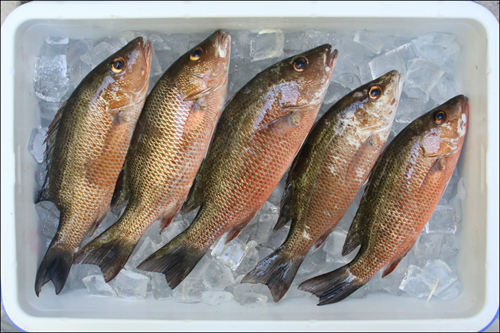 Tommy says greenies, mojarra and silver mullet continue to keep the bait buckets full. Earlier this week Sebastian Inlet Fishing Report regular, Mike Ricciardi of Vero Beach, fished the north jetty in the A.M. and reported about a dozen snapper coming over the rails. Two of the successful anglers that morning included Sebastian's Tony Swiderski who landed his limit of mangrove snapper, and Chuck Fischer of Satellite Beach who caught one snapper and one spot. Mike said a few boats landed a couple of C/R snook and one angler casting plugs on the outgoing tide by the buoys hooked up with an oversized red. Mike also noted abundant greenies and mojarra in the tide pool. 07-29-15 WEDNESDAY: LOBSTER MINI-SEASON IS TODAY AND TOMORROW! It's very nice at the inlet this morning. We have winds blowing out of the West-Southwest at 6 mph, gusting to 10 and the water is very calm. Winds are expected to increase this afternoon and we have a good chance of rain. We have cloud cover over the inlet this morning which keeps our inlet anglers from getting beat up by the sun, but could impede our lobster divers today. We reached into the archives for today's photo to celebrate the two day lobster mini-season which starts today and ends tomorrow. Regular season starts August 6th and runs through March 31, 2016. Randy Dudley of Indialantic caught this 7 lb. lobster in 2011. What a monster! At its June meeting in Sarasota, the Florida Fish and Wildlife Conservation Commission approved a new and exciting opportunity that will encourage divers to remove invasive lionfish by allowing them to take one extra spiny lobster each day during the two-day sport season this summer (July 29-30) that they also harvest 10 lionfish. In addition, people can take a photo of their lionfish and lobster catch during the two-day season and post it on Facebook.com/LionfishReefRangers to get a "Be the Predator" T-shirt. One lucky photo entrant will also win a lifetime saltwater fishing license via a drawing held shortly after the sport season. For the 2015 spiny lobster sport season only, divers will be allowed a single spiny lobster over the bag limit per day for each day that they also harvest 10 or more lionfish. Lionfish must be kept as proof of harvest while on the water. When off the water, a photo of harvesters with their 10 lionfish must be kept to document eligibility for harvesting an extra lobster. Lionfish must be harvested the same day and prior to taking the additional lobster. All other rules, including no spearfishing zones, apply. The two-day spiny lobster recreational sport season (also known as mini-season) falls on the last Wednesday and Thursday of July each year before the Aug. 6 opening of the regular season. During this two-day season, the regular bag limit is six spiny lobster in state and federal waters of Biscayne National Park waters and off Monroe County, and 12 spiny lobster elsewhere. There is no bag limit for lionfish; harvesters can take as many as they want. If the program is successful at encouraging lionfish removal, it could be continued in future years. July can be summed up in three letters....HOT. It has been warm lately on the Treasure Coast and we can expect more of the same in August. With temperatures reaching the 90's on any given day, you must plan and prepare for each voyage on the water. Simple things like drinking lots of fluids and wearing a hat and sunglasses are important things to remember. Early mornings or late evenings will be the best times to enjoy the fishing and beat the worst of the heat. Stay safe and have fun out there! 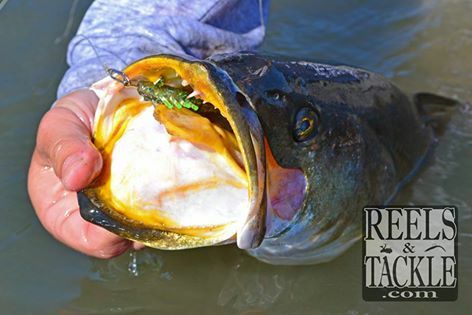 We continue to have a good bite with a variety of fish on the river. Trout have been biting on the grass flats on DOA shrimp, Monster 3X or live bait. 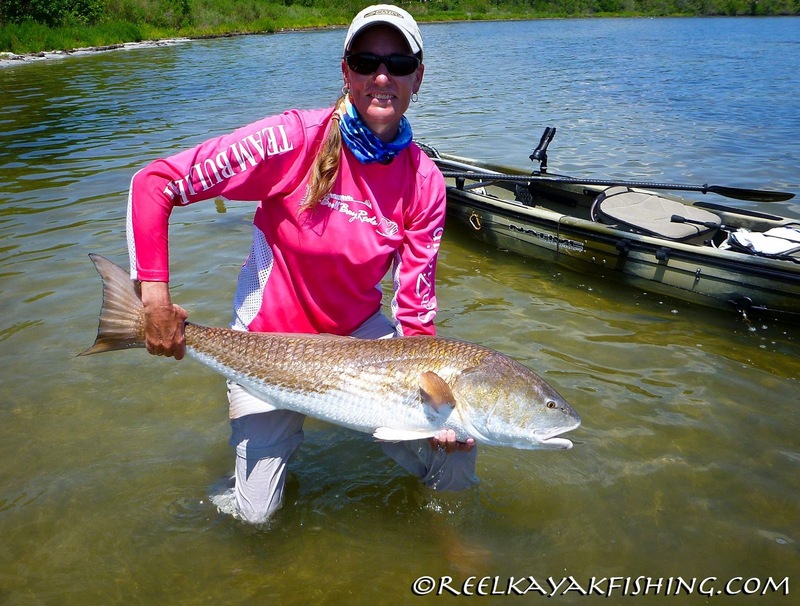 Our redfish have come from under the mangroves or docks lately. You can find snapper all over the river with some nice size mangroves available around the docks and bridges on live or dead bait. 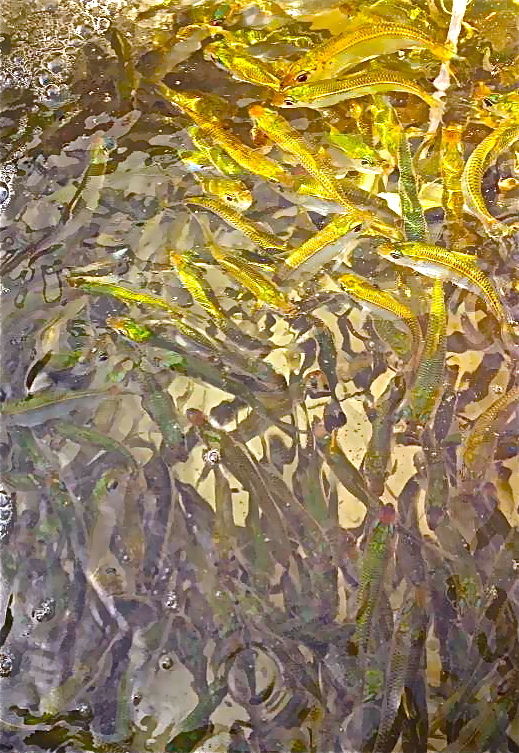 Mackerel and jacks have been hanging in the turning basin of Fort Pierce feeding on the glass minnows. 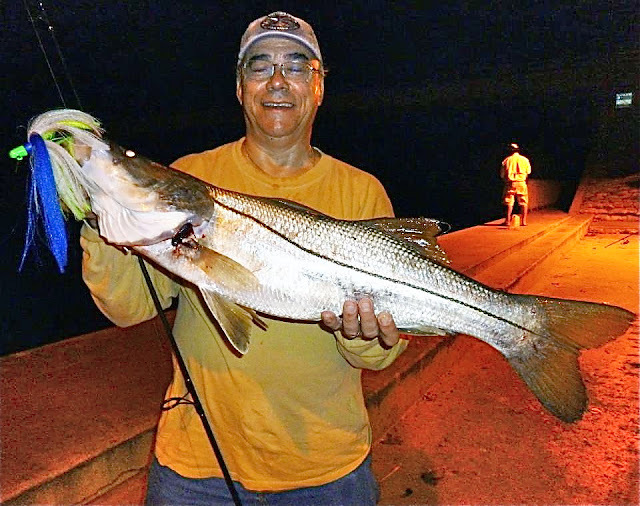 Snook fishing around the jetties has been good for night or early morning anglers. As more bait filters into the river, look for the bite to continue to improve. Inshore the fishing has been steady in the morning and in the evening with a few nice trout around J.C. Park on the incoming tide with a few nice snook mixed in.The reds have been around Queens Cove to Harbor Branch soft baits and copper spoons have produced well.The beach fishing has been steady with the tarpon and snook in the bait schools around the cove in Vero. We have another lovely summer morning at the Sebastian Inlet. Winds are blowing out of the Southwest at 14 mph, gusting to 18 which keeps the no see 'ums away and helps keep our inlet anglers cooled off. We have summer showers and thunderstorms in the forecast as usual, so keep it in mind when heading to the inlet. We don't have many anglers out on the jetties this morning as fishing remains slow. We received an update from inlet regular Mike Ricciardi who reported this morning was very nice out on the north jetty but the bite is slow. Inlet regulars Chuck Fischer of Satellite Beach and Tony Swiderski of Sebastian landed a few Mangrove Snapper on the end of the incoming tide. A couple of young men were sight casting plugs to a school of Reds from the sea wall but they couldn't get them to bite. There's plenty of bait in the water but Barracuda are keeping the Mackerel and Bonito away. Mike's neighbor Bob Green landed a real nice 20" Mutton Snapper off the south beach last Friday. Shorty's Famous Breading & Hush Puppy Mixes they did a Half and Half mix of these on some Shrimp and Mahi.... 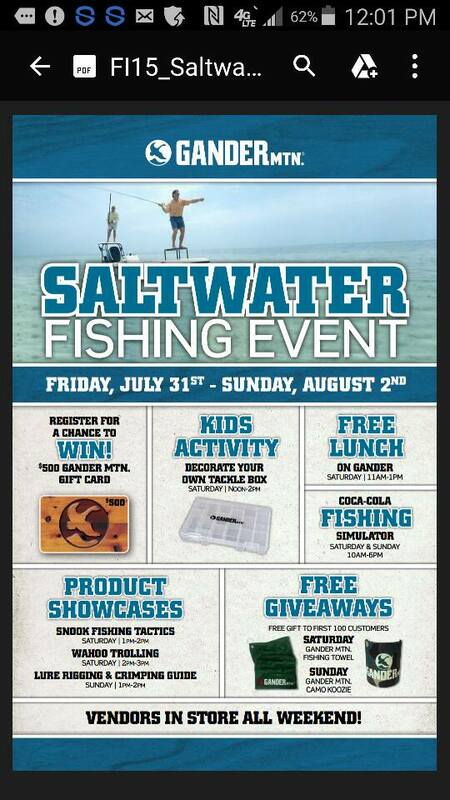 I wanted to say at their booth all day smile emoticonGot to get me some of this mix ......."SON"
I Scouting around Saturday and was suprised to see "HOW MUCH" sand was put in at Ft Pierce inlet. I don't know if this is good or bad fishing wise, they filled in about 60-75 feet or more of the jetty. One of my favorite flounder spots is "GONE". I know Mother Nature will take back some but "WOW"
We have a nice breeze this morning which is helping keep things cool out on the jetties. Winds are blowing out of the South-Southwest at 11 mph and there is a light chop on the water. We have showers and thunderstorms in the forecast, which is typical for this time of year. Rain has the water looking a little murky. This morning big Jacks are hitting along with a few big Reds according to Tommy Turowski at the Sebastian Inlet Bait and Tackle Shop. Tommy reported a few Snapper came over the rails over the weekend. 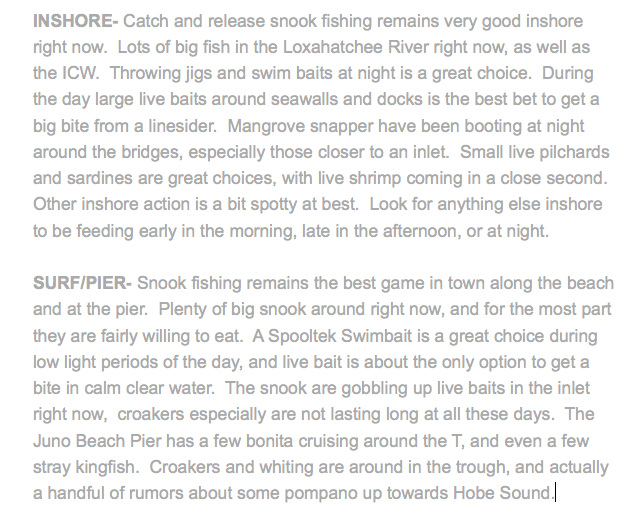 C/R Snook, Bonito and Barracuda are out there as well. Our photo today is courtesy of SISP Ranger Ed Perry. Ranger Perry took this nice shot of a mama Loggerhead returning to the ocean after laying her eggs. The beach fishing has been good with a few tarpon around the Vero Cove with a few kingfish around to.Inshore the fishing has been steady around first light and a few hours before dark with a few nice trout and snook around Bear Point to Middle Cove.The inlets have had a good snook bite with live bait on the out going tide,The south jetty in Ft. Pierce has had some flounder and a few snook and jacks live shrimp has produced the best. A Buggy Productive Morning "R-man's a Witness"
Inshore the trout bite has been steady around Midway road to Walton with live shrimp and soft baits.The bridges have had some nice snapper around them with a few flounder starting to show up to.The snook bite is still steady in the inlets with live bait with some jacks and tarpon mixed in. Winds are blowing out of the West-Southwest at 6 mph this morning and the water has a light chop. We have a decent boating forecast for the weekend but as usual, showers and storms are predicted. Always check the NOAA forecast prior to boating as conditions can change very quickly. 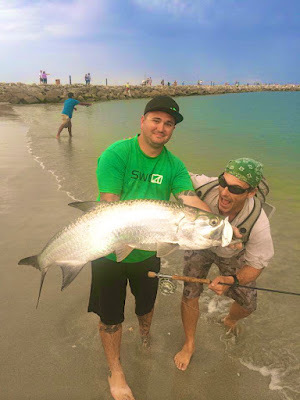 Tommy Turowski at the Sebastian Inlet Bait and Tackle Shop reported a quite a few Bonito in the water along with a few Jacks, Snapper, C/R Snook and Reds. A couple of Barracuda are patrolling the north jetty and they tend to keep fish away. 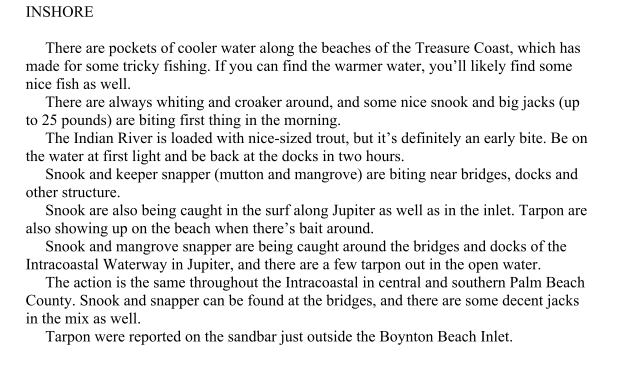 No see 'ums are out and biting this morning, be sure to take insect repellent if your head to the inlet! 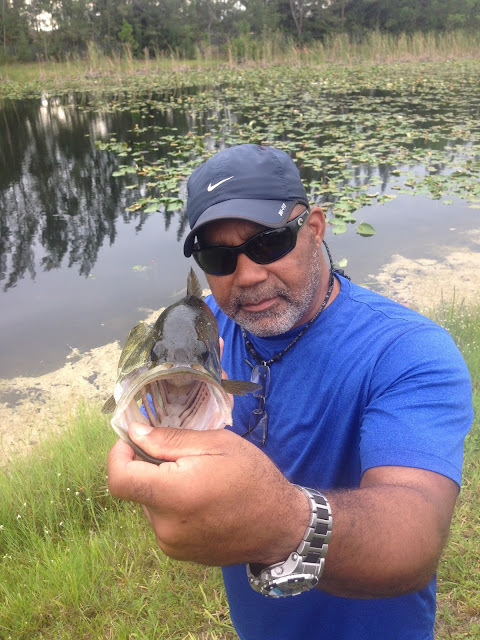 Our angler of the day is Walt Eldon of Indian Harbour Beach. 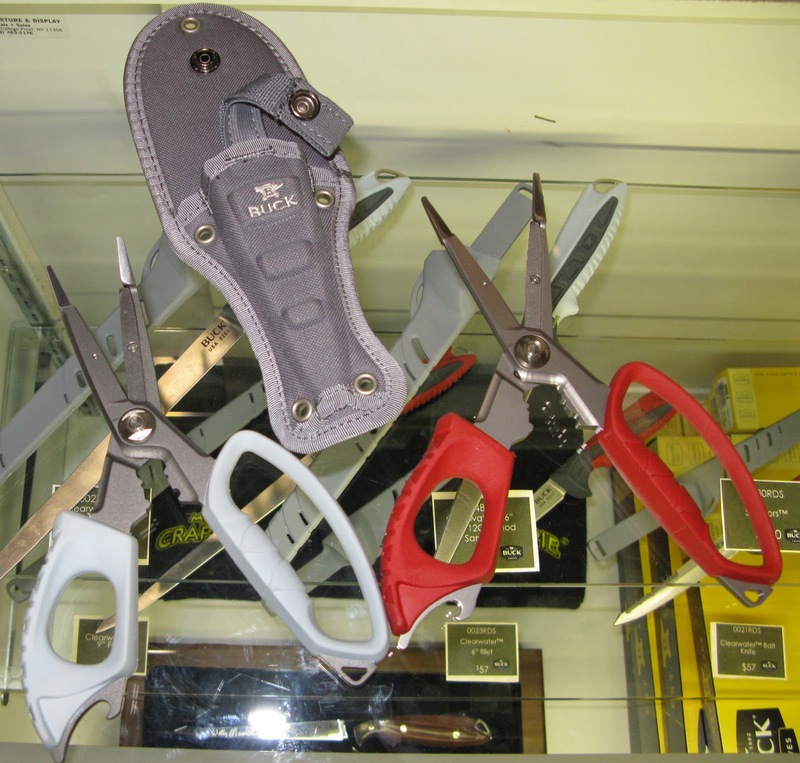 Walt was surf fishing using a gator spoon when he found a large school of Reds feeding on menhaden. Walt landed five big Reds, up to 30 lbs.! All the Reds were released unharmed. 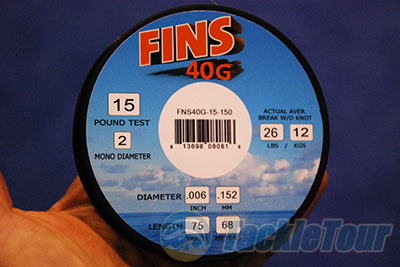 Without a knot, FINS 40G actually tests much higher than its labeled breaking strength. 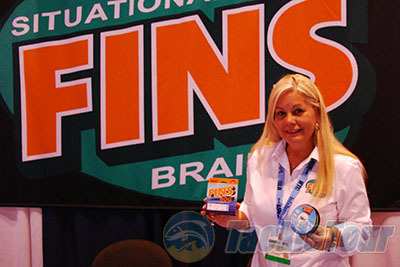 40G Superline: The folks at FINS are touting their new 40G Superline as being superior to all other braids on the market. This is a pretty bold statement considering the stiff competition that already exists today. FINS tells us that this line boasts a special composite structure which in turn gives it a mono-like smoothness with extreme durability. It indeed felt very smooth to the touch and seems like it'll be a great long-casting line. Fins 40G exhibits impressive stats. Available colors are blue, white, and chartreuse. One of the most exciting aspects of the 40G lines is the fact that they are extremely thin. As an example, the 85-pound line carries a mere 12-pound test diameter, while the 65-pound line is as fine as 8-pound test! 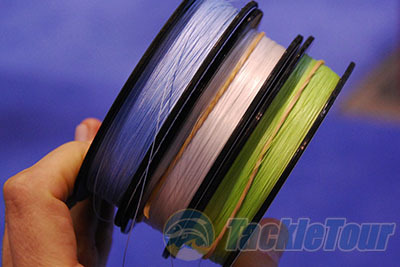 This will allow an angler to increase line capacity or spool heavier line on smaller reels, if so desired. Thanks to Karla Burch for showing us this new superline. Conclusion: FINS 40G Superline will hit the market beginning in mid September. Consumers will have their choice of six different tests including 5,15,25,45,65, and 85-pound sizes in 150, 300, or 1,500 yard spools. Expect MSRP to range from $25.99 up to $236.25 for the largest spool/test. Fishing line is not something to often get too excited about, but the new 40G Superline has our interest.We can't wait to spool some up for ourselves and hit the water! It's still hot on the Treasure Coast with temperatures staying in the 90's most days. 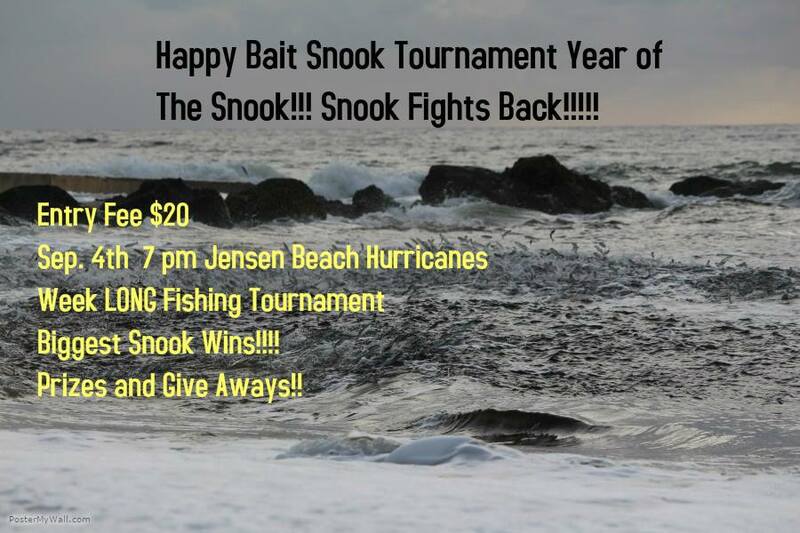 It has made it a challenge to anglers who fish inshore. Water temps have risen to 89 degrees on some days and the fish certainly do not like it that hot. The recent upwelling in the ocean has been bringing colder water into the river and actually helping by mellowing out the hot water temps. Our best fishing has been early before the sun heats things up and drives the fish to deeper water. Trout has been best at first light on the grass flats. We have caught some nice size fish over the slot recently. Getting out early can increase your chances. Once the water heats up, move to drop offs, tidal cuts and mangroves. Shaded areas, like mangroves and docks, can be productive when the sun is high. Try top water lures in the early hours of the mornings or at sunset. Switch to Monster 3X or DOA shrimp or shad tails around the drop offs and deeper grass flats once the sun is high. Fish will be in the shallow water to feed before it gets too hot out. You can find redfish hanging under docks and mangroves in the shade. There are lots of snapper around the river and we have caught lots of keeps size fish. 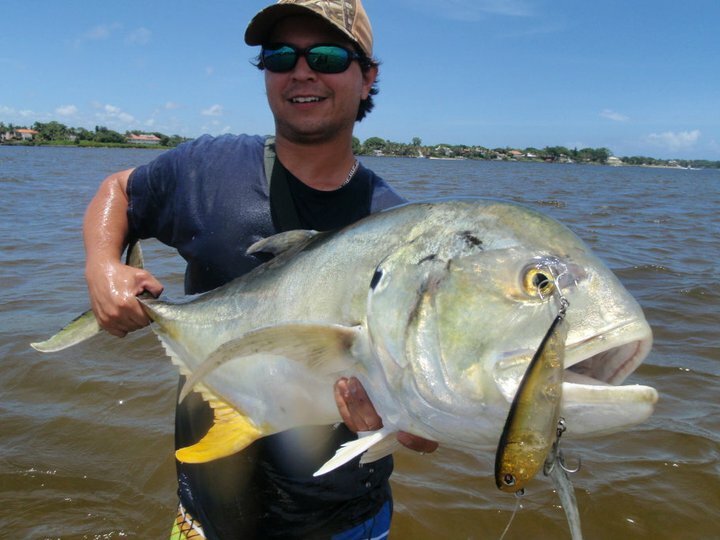 Jacks have been patrolling the river and will give you a good battle on a light rod. 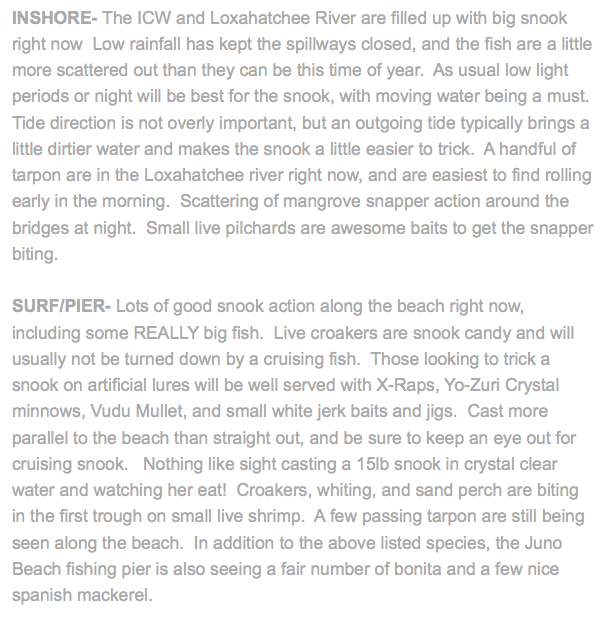 We have had Spanish mackerel moving into the inlet with the incoming tides lately. There are plenty of fish to be had if you keep your eye on the water temperature and find areas that are a few degrees cooler. We have another month of hot weather ahead, so plan your trips around the heat. Use plenty of sunscreen and drink lots of water! It's vital to keep hydrated in this kind of weather. Hats, cool rags or anything to help beat some of the heat can make your day much more comfortable! We have another lovely morning at the inlet. It's hot and humid but it's not as bad as a lot of other places around the country. We have that nice sea breeze blowing at 8 mph out of the West-Southwest this morning which is keeping our inlet anglers a little bit cooler. There is a light chop on the water. We are experiencing typical summer weather patterns and unless there is a tropical disturbance we can expect more of the same. Late afternoon showers and thunderstorms are the norm, so expect more of those too. Fishing is slower this time of year; it's as predictable as the weather patterns. We see scattered species in small numbers. Even though there are baitfish in the water, the bite remains slow. A smattering of Snapper, Reds, C/R Snook, Bonito, Little Tunny and Mackerel have been landed but Jacks seem to be the most active. Anglers fishing from a vessel have better luck by going to find the fish hide outs. Shore-based anglers are not as fortunate. No matter, get out and enjoy the fresh air and beauty of the outdoors! Our angler of the day is Bill Hufford. 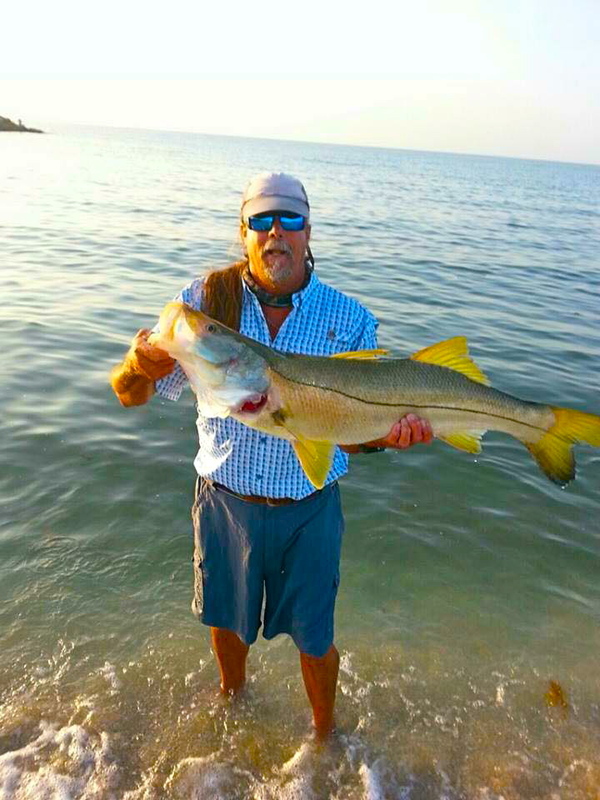 Bill landed this big 36" C/R Snook while fishing the inlet. 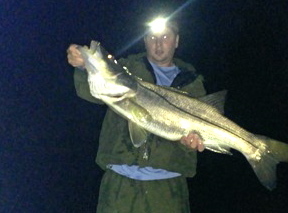 The nice Snook was released right after the photo. Inshore yesterday there were a few reports of some nice reds to the north from Harbor Branch to Vero shores soft bait such as the Monster 3X and D.O.A cals have produced well with a few nice fish on topwater around first light.The snook fishing in the inlets have been steady with live bait in the day and jigs at night please take care of the fish and release it quickly so it will swim away unharmed. Inshore the trout bite has been steady around midway road to Walton road at first light top water and soft baits has produced well.The snook bite has been steady in the inlet with both jigs and live bait remember take care of the fish before you release it,Beach fishing has been steady with some nice tarpon and snook find the bait and you will find the fish. What a beautiful summer morning at the Sebastian Inlet. Winds are blowing out of the West-Southwest at 8 mph and the water is clean and calm. The action has been slow. 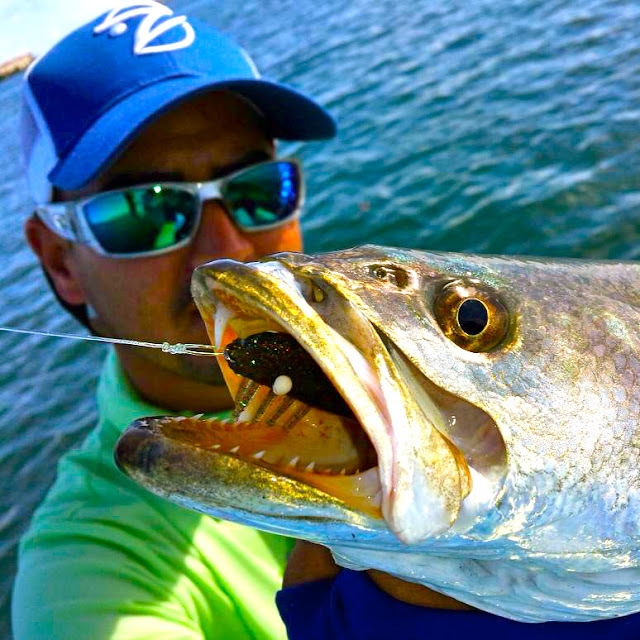 Jacks, Bonito, C/R Snook, Reds and Snapper are out there but the hits are few and far between. At its June meeting in Sarasota, the FWC approved a new and exciting opportunity that will encourage divers to remove invasive lionfish by allowing them to take one extra spiny lobster each day during the two-day sport season this summer July 29-30 that they also harvest 10 lionfish. Satisfying and easy to make, these fish tacos topped with peach salsa are perfect for a summer supper. It’s summertime, which means days are long and free time is short. The perfect summer suppers are those that use seasonal ingredients and require minimal effort, and fish tacos are the trifecta: fresh, fast, and flavorful. Any firm white fish will work well for tacos. Try using grouper, snapper, or triggerfish, which are all bountiful in the summer. As for taco-topping combinations, they’re limitless. Try cabbage, pickled onions, sautéed squash, fresh tomatoes, or your favorite seasonal produce. 1. Combine dry seasonings in a small bowl. 2. Pat fish fillets dry. Coat both sides of fillets with olive oil. 3. Using your hands, rub the seasoning into both sides of the fillets. 1. Move the oven rack to highest position and preheat broiler on high. 2. Line baking sheet with foil and spray with nonstick spray. 3. Place fillets on the foil. Broil for 6-8 minutes, flipping halfway through, until opaque and flaky throughout. 1. Place fish fillets in the center of a large sheet of foil. Wrap fish in foil to form a loose but airtight foil pack. 2. Place pack on a medium-heat area of grill. Grill for 6-10 minutes, flipping pack halfway through, until fish is opaque and flaky throughout. 1. Stack tortillas and wrap in aluminum foil. Heat in oven or on grill until tortillas are warm (approximately 10 minutes). 2. Stack two tortillas together. 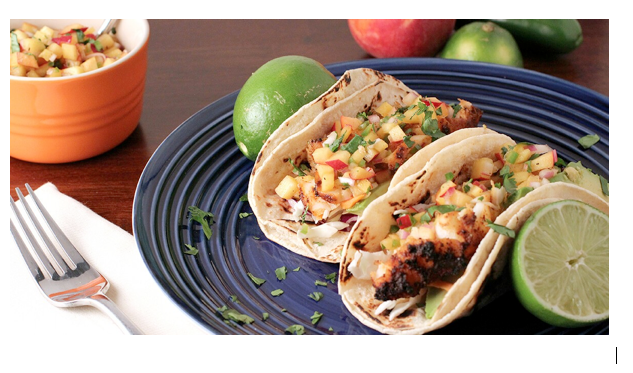 Add fish, lime juice, peach salsa, and toppings of your choice.